Cellular One has launched a unique new App called Chill VoD, which dramatically improves how users can search and discover their preferred VoD content, ensuring that they always get the lowest possible price for premium shows. The Chill VoD App is based on the unique capabilities of the Vennetics Mobile Video Platform. 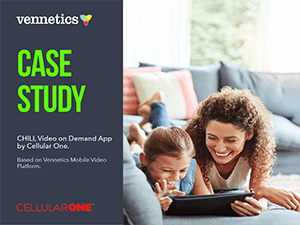 New research contained in this report from Cellular One subscribers with mobile data plans, explains the pain points for consumers renting and streaming online movies, and demonstrates how these issues can be best addressed by broadband service providers. 87% of consumers stream or rent premium video content on a weekly basis. 87.5% find cross-catalog search capability useful. 9 out of 10 consumers want a single app to help them search for content across catalogs. 58.3% of consumers have rented a movie only to discover later that the same movie was available to view for free on another service.